Dieser wunderschöne Full-Brogue ist Crockett’s bester Qualitätsschuh, auf einer Ebene mit dem “Hand Grade” – natürlich rahmengenäht mit Itshide Commando Sohle. Die Qualität des Kalbsleders (wiederum ungenügend auf dem Foto porträtiert) ist Crockett’s berühmtes, Top-Qualitäts-Kalbsleder/Full-Grain. 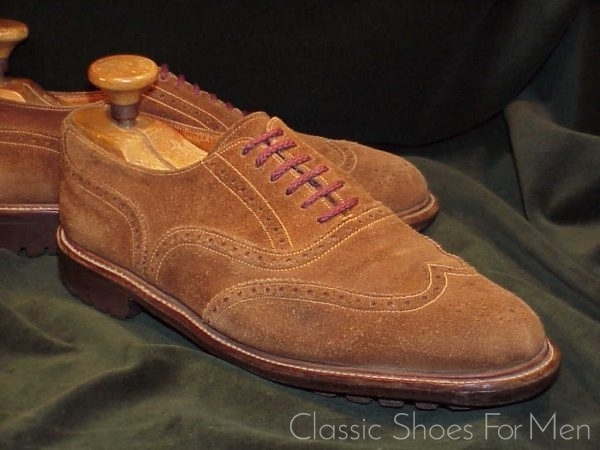 Ein idealer Schuh, wenn Sie das Land oder Ihren Landsitz besuchen, kombiniert mit weiten Tweeds (“baggy tweeds”) oder “knickerbockers”, jedoch genauso passend als Tagesschuh für die Stadt. 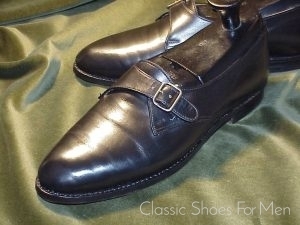 Er ist DER saloppe Tagesschuh und natürlich ebenfalls mehr als perfekt zu allen saloppen Gelegenheiten, zu denen sie sich in Ihren Kakis, Tweeds, Checks, Cordroys und jedweden Erdtönen am Wohlsten fühlen. 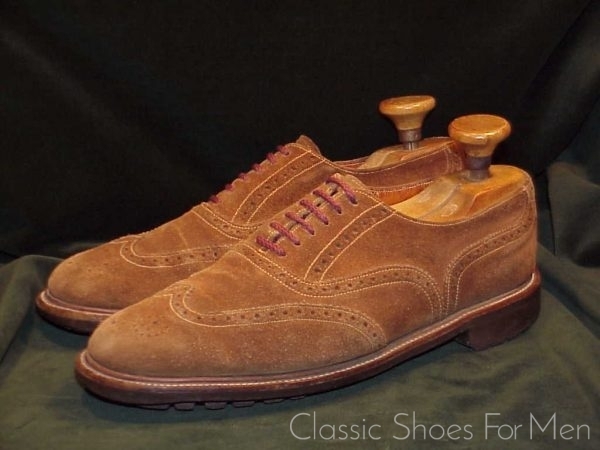 Persönlich bin ich ein grosser Fan von Wildleder und ich finde den “Full Brogue” oder ”Half Brogue” in Wildleder so kleidsam wie salopp. Auch meine ich, dass Suede mit den Jahren und durch alle Wetter hindurch sogar noch gewinnt und dabei aeusserst leicht zu pflegen ist. 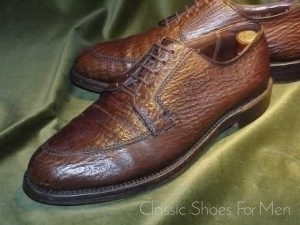 Ein eleganter, bequemer und hervorragend gearbeiteter Schuh im Wert von 500 Euro. 42.5D, für den mittel-breiten Fuss. (US 9.5D) (UK 8.5E). 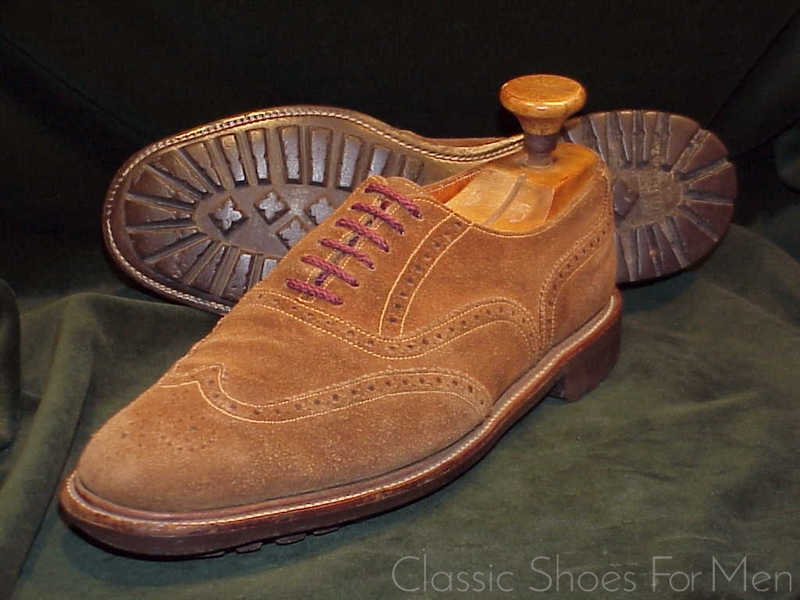 This robust All-Weather, All-Terrain Suede Full Brogue is an earlier Crockett production for Polo, Ralph Lauren. 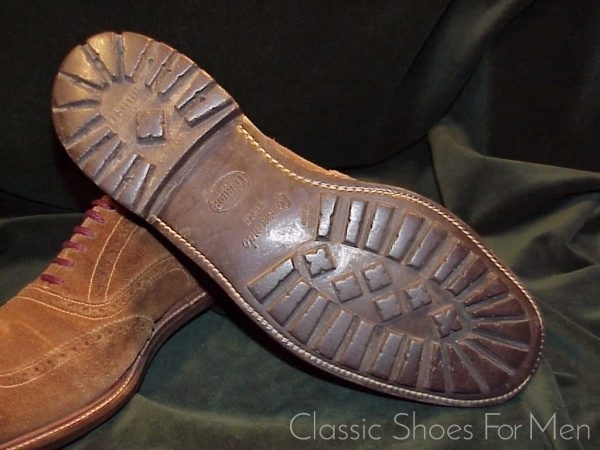 Goodyear welted with the worlds best (and most imitated) rubber sole, Itshide’s “Commando” sole. The actual colour is the just the right dusty, warm, medium-brown. The quality of the suede, again, difficult to see in the photos, is Crockett’s well-known full-grain calfskin suede, virtually impervious to weather or abrasion. 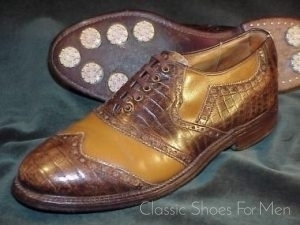 About the model: This is an ideal shoe to wear when surveying your country estate in your baggy tweeds or knickerbockers, but equally suitable for daytime wear in town in inclement weather. 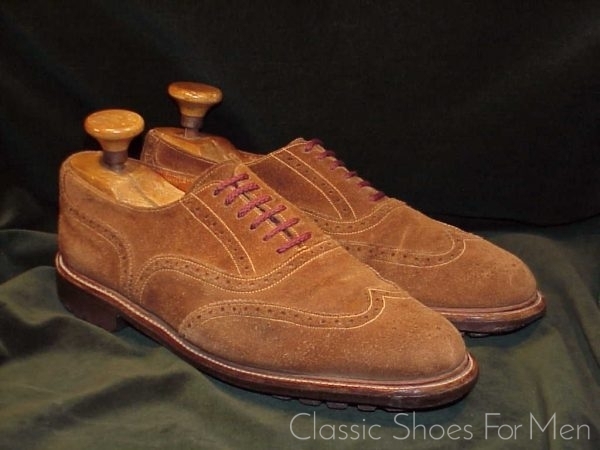 Of course also perfect with a blue blazer and flannel “bags”, not to mention any casual dress; kakis, tweeds, checks, corduroys or any earth-tones suitings. 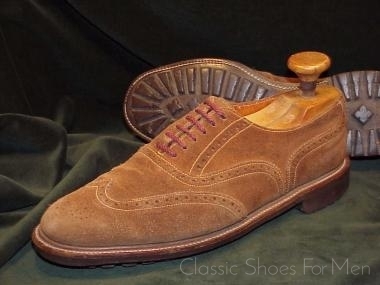 Moreover, this is the kind of shoe that, in this highest of quality calfskin suede, requires no more than a quick brushing when dry to be clean and fit to wear again. 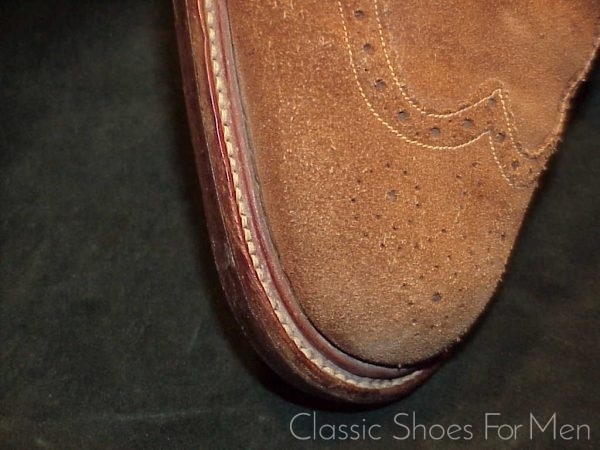 I find my Suede shoes improve with age and weathering; they become more handsome with a few years and miles on them and are simple to maintain. 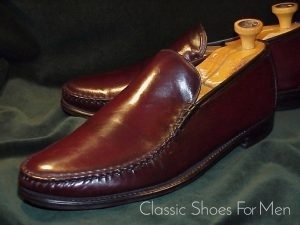 An elegant, comfortable and finely made shoe and a Euro 600+ value. US 9.5D (UK 8.5E) (Continental 42.5D) for the mid-width foot. 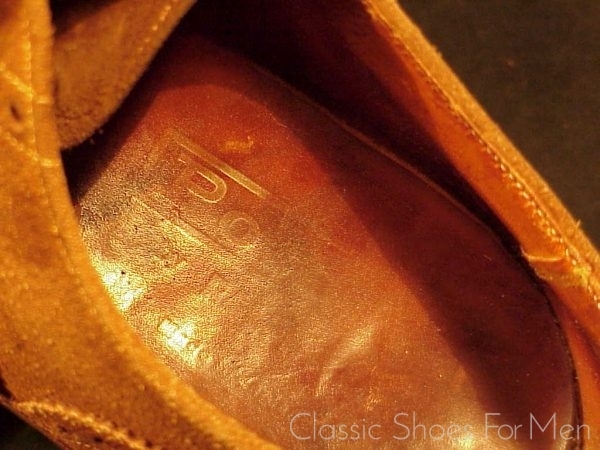 A well used pair with much of its life still ahead of it.